Ever wonder what it would be like to hang out with a pop star? To see them behind the spotlight? For Junie she gets the chance, but before long she discovers she's falling for Roman. But Roman is still famous, and he'd never go out with a girl like Junie, right? 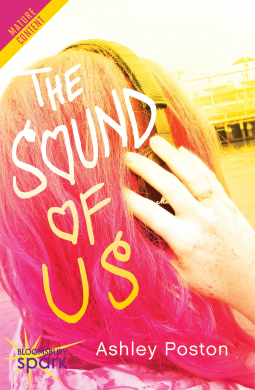 The Sound of Us is a epic tale of love, loss, friendship and being true to who you are. This story will go far with you, even after you have read it. Junie was a great female lead. She is surrounded by sadness because of her father's death. Believing that this would make him happy, she continues running the bar her Dad created and left behind. Junie loves music, and when Roman appears in her life, she just can't believe it. Roman is your typical band member, however he wants to remain invisible for a while, and when he discovers Junie, he sees this as a perfect opportunity. I really liked it when we could see behind the scenes as we met Roman. We can really see what he's like as a person. I thought it was clever as both Roman and Junie want to be themselves with each other as well as remain hidden. However, when someone from a famous band gets spotted, it will soon ruin everything that's going on, and both characters have to realise if what they have - their friendship - is real. I really liked the relationship Junie and Roman had. It was just flawless and perfect, and you could really see the connection. In a way both the characters help each other, especially when they don't realise that they need the help. It really was a beautiful story that was perfectly written. It was so emotional, and I found that I myself could understand what the characters were feeling. I felt like I was there. I really connected with the characters. Even though this book does contain swear words, it does - in my opinion- make it more realistic as people do swear in real life. If you do take offence to swearing, then maybe go into this book with that caution. There isn't a lot though. The story is written from Junie's perspective, which I liked as we got to dive into Junie's life and can understand her feelings. The chapters also have a decent length, which is good. At the beginning of the book we are introduced to Junie and her life, and I liked how it was described. It was easily explained. The ending was perfect. It is really cute. It doesn't end in a cliffhanger, but it still leaves you wondering what is going to happen next. On Goodreads, this book is listed as a first book in a series, so I would like to continue with this series as soon as the next book is out. Overall I gave this book five out of five stars. If you like books about music, band, friendships and bonds, then this is definitely for you.